1978! My first game in a box. The first 5000 copies were in a conventional box with a purple background. The ad people at TSR hated the color combination, so when the second printing came around, the purple haze turned white. Also, the second printing had a plasticized wrap around board with velcro closure. The rules, dice, and pieces were in a box inside the playing board (which shrank some). Personally, I liked the larger, paper playing board that came with this first printing. The third printing (my guess is some time in 1980) was in a big flat box (same size as the second printing of Awful Green Things). The game has lay dormant for a long time. 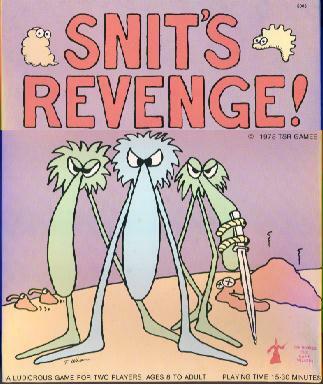 However, a redesign of this and Snit Smashing has been released by Steve Jackson Games. It's just called Snits.